Journey with us as we take a closer look at the attraction with some cool facts and photography of the thrilling new attraction! 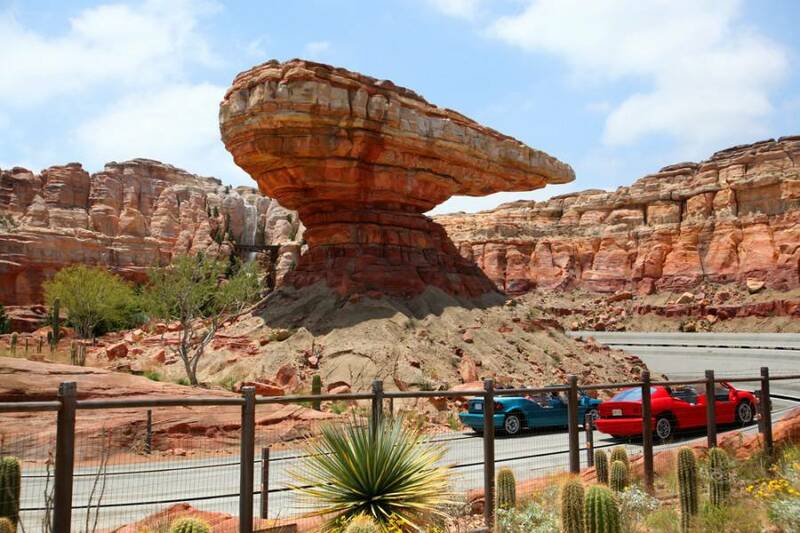 Radiator Springs Racers features a stunning backdrop, the Ornament Valley Mountain Range that also services the entire 12 acre Cars Land. 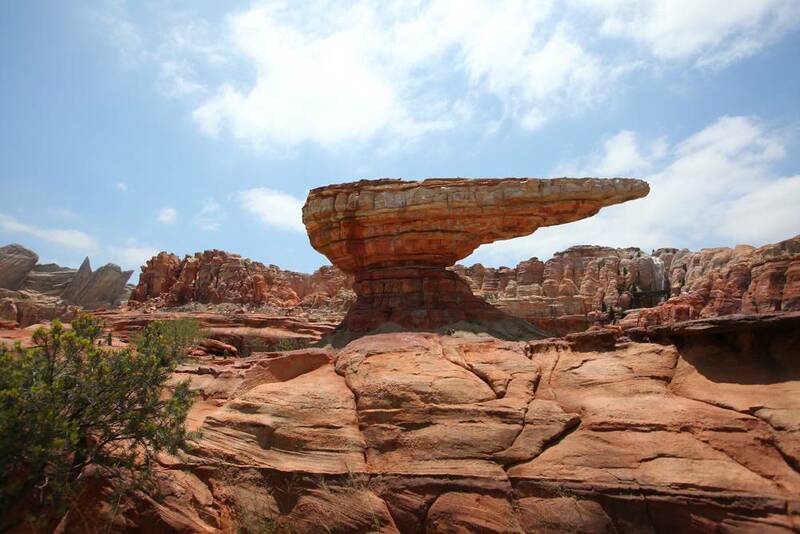 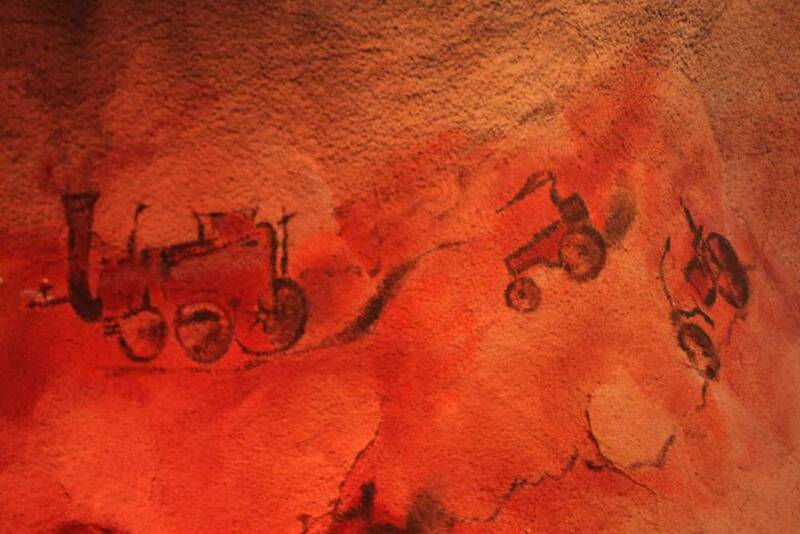 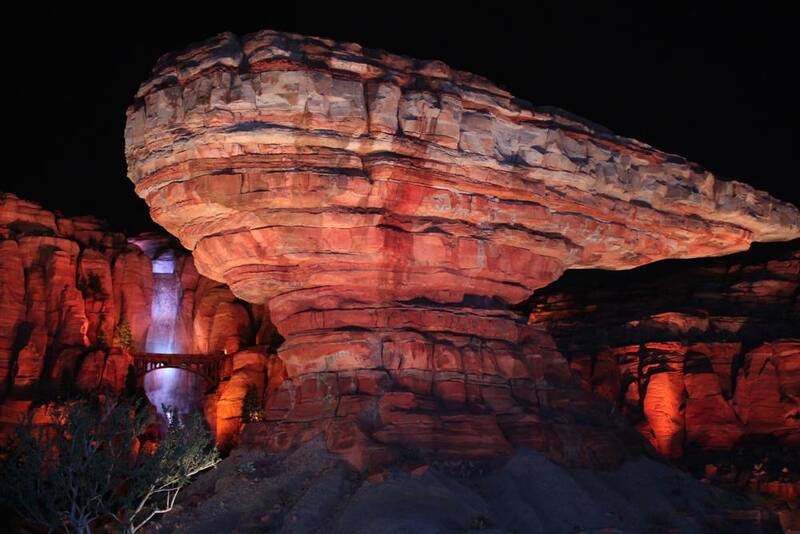 There is 280,000 square feet of rockwork, the largest created in a domestic Disney them park. 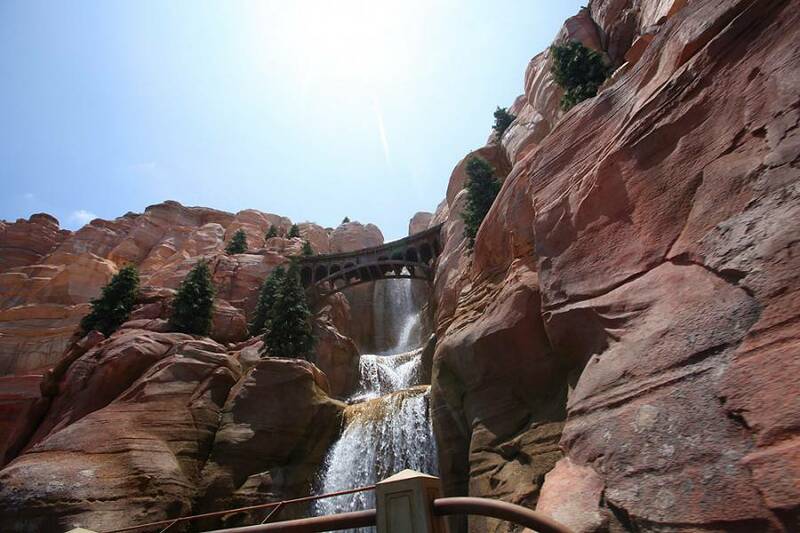 The highest peek is 125 feet, towering over the 77 ft. Sleeping Beauty Castle. 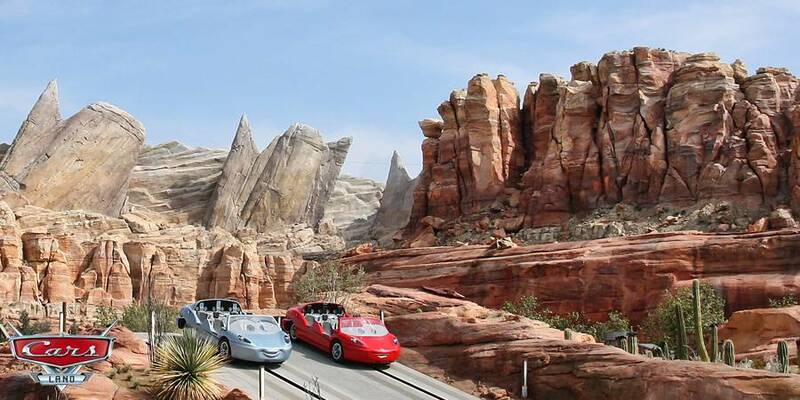 Six distinct car tail fins are represented in the Ornament Valley range, inspired by classic car models from 1957 to 1962. 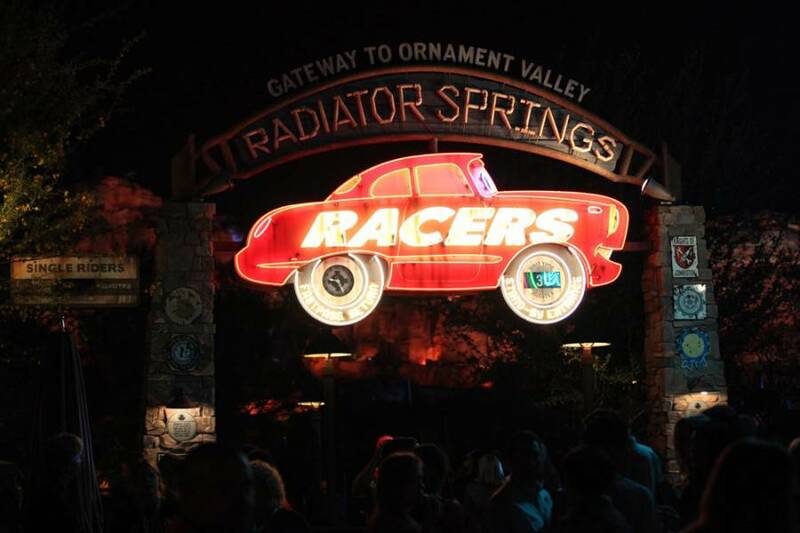 You can also find hood ornaments, wheel wells and radiator caps represented in the rockwork. 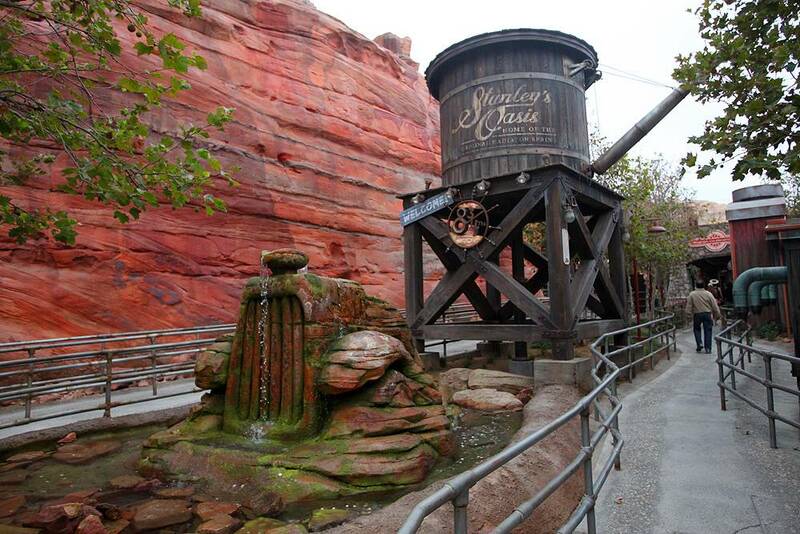 The attraction’s queue leads you through an older section of town founded by Stanley (A statue of him is immortalized in front of the court house). 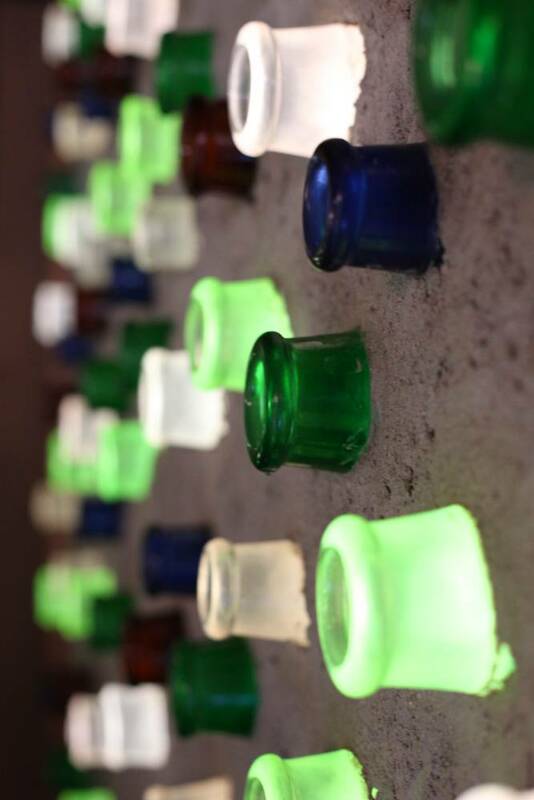 Along the way you’ll find a shack made in part by oil bottles. 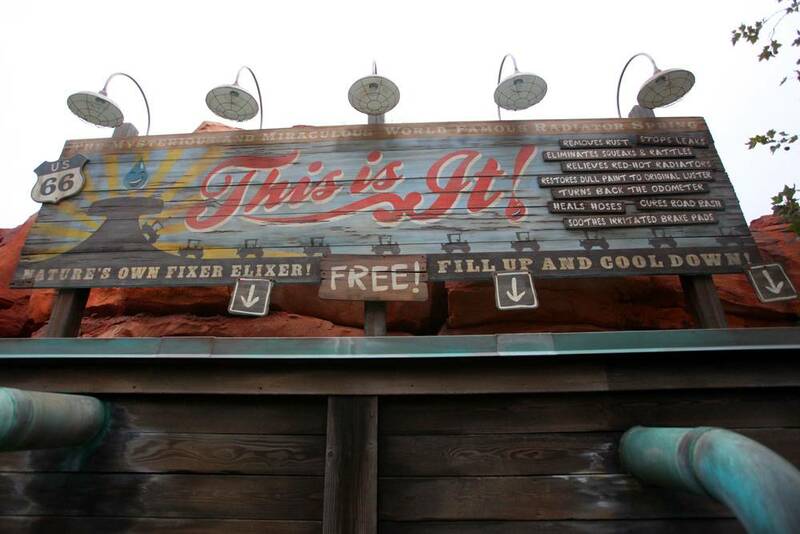 You may also spy a few of the 450+ specimens of trees and cactus on your way to the loading area. 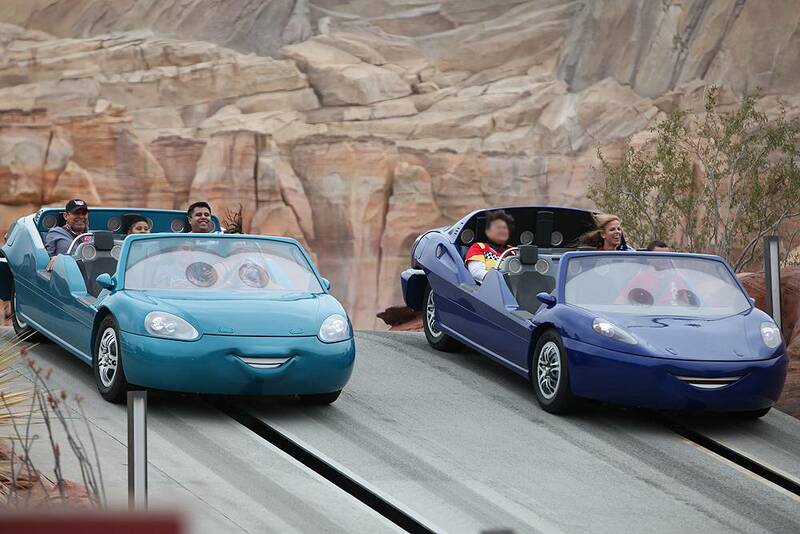 You board your car that seats six (two rows of three) and comes in several different colors or expressions. 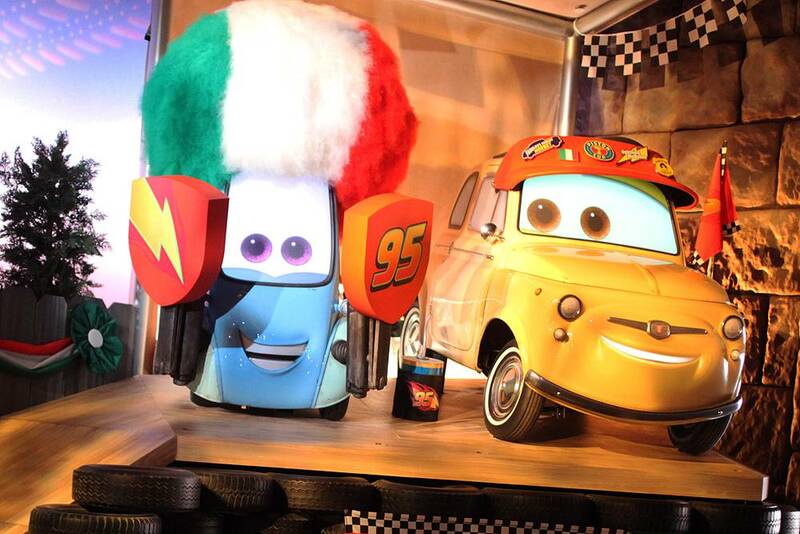 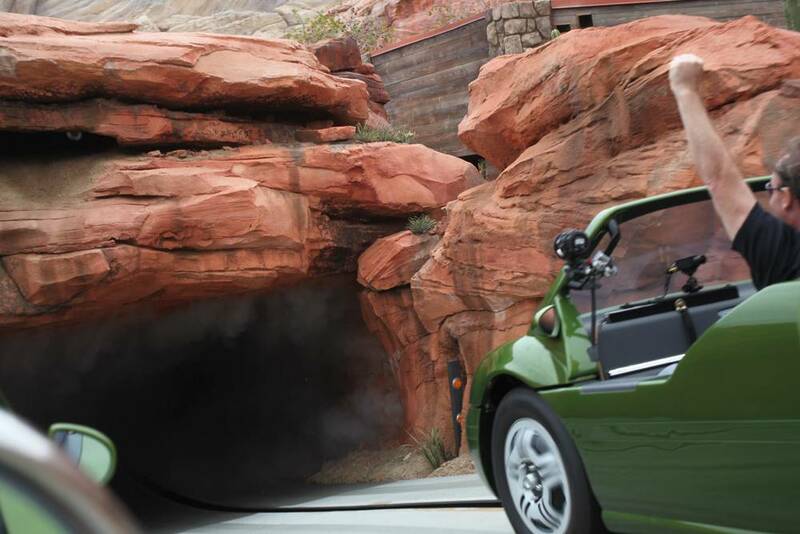 Sheriff and Ramone deliver your safety spiels before you take a cruise through Carburetor County. 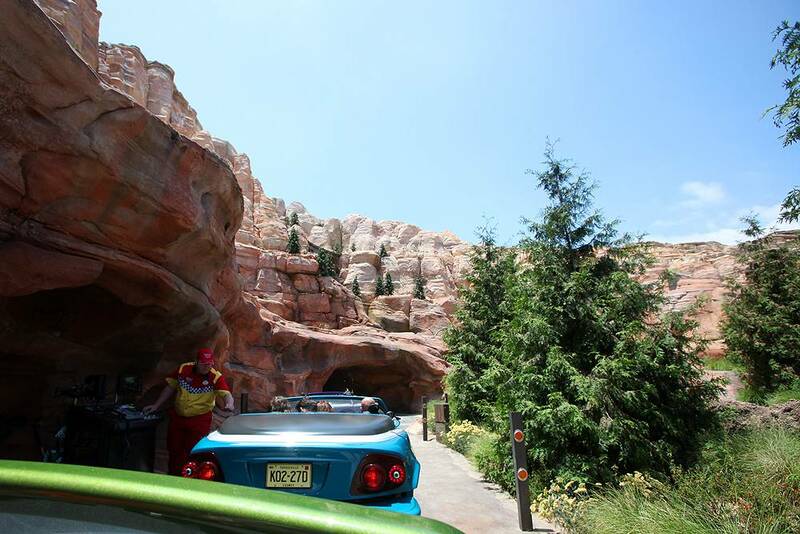 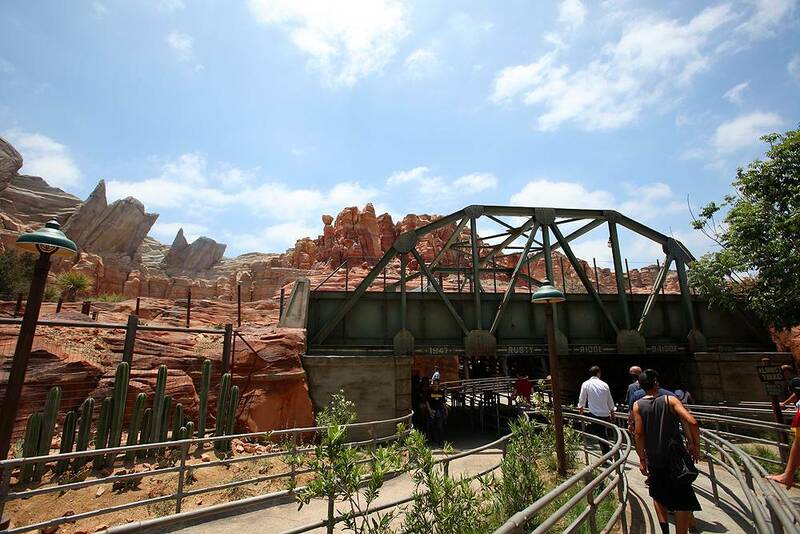 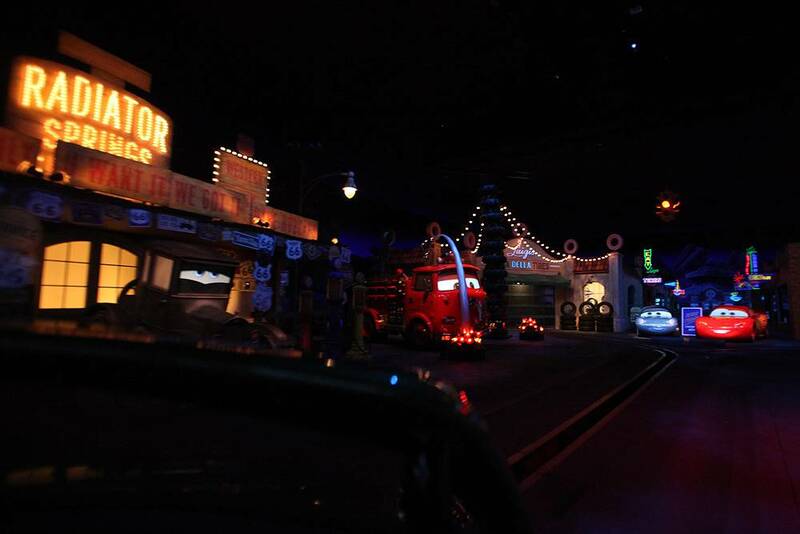 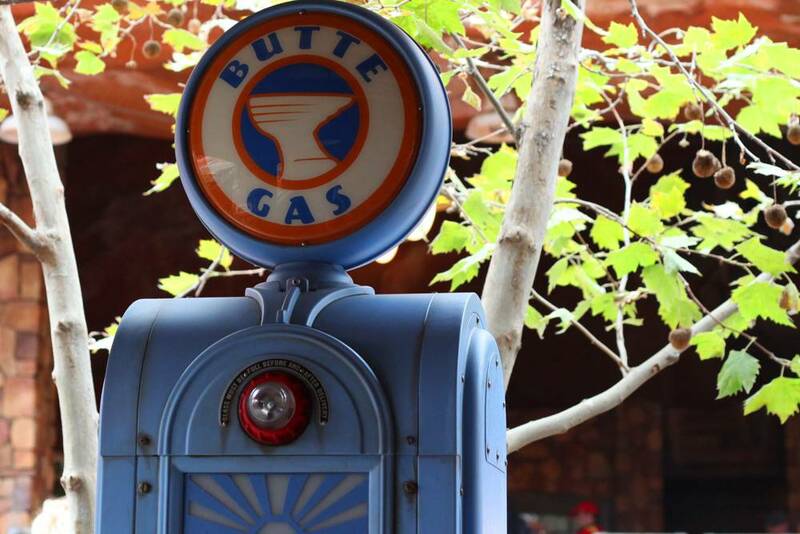 Before the big race, you still need to venture into Radiator Springs. 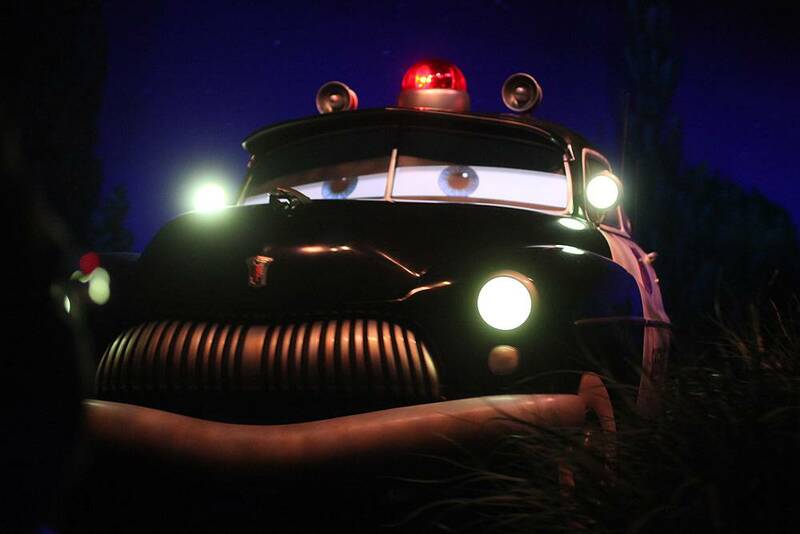 You first see Mack (who calls you a road hog), Minni and Van, and speed up to beat an oncoming train before you bump into the Sheriff who urges you to slow down. 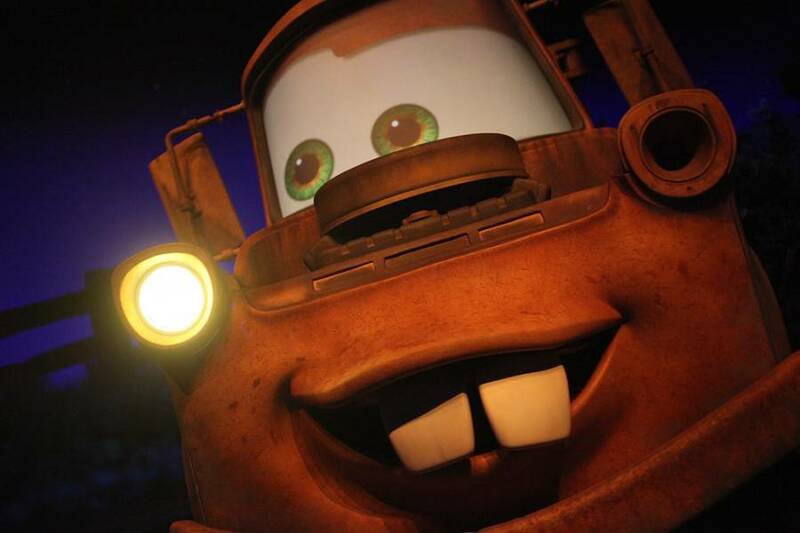 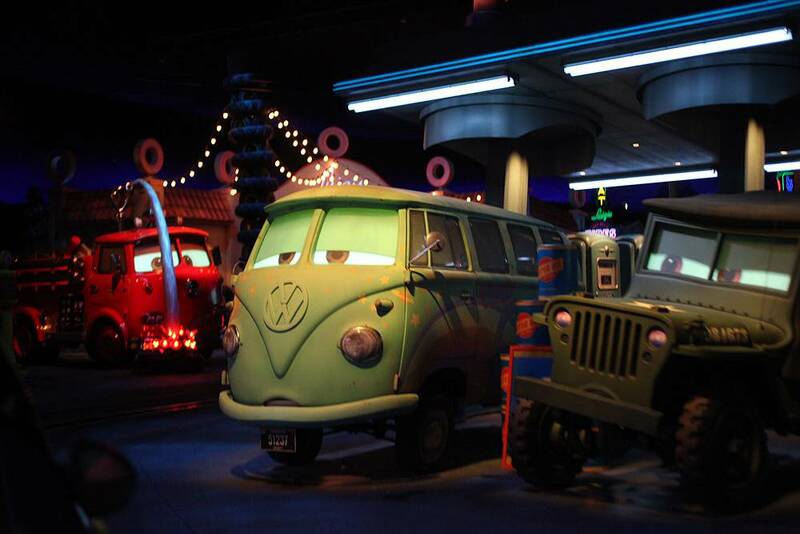 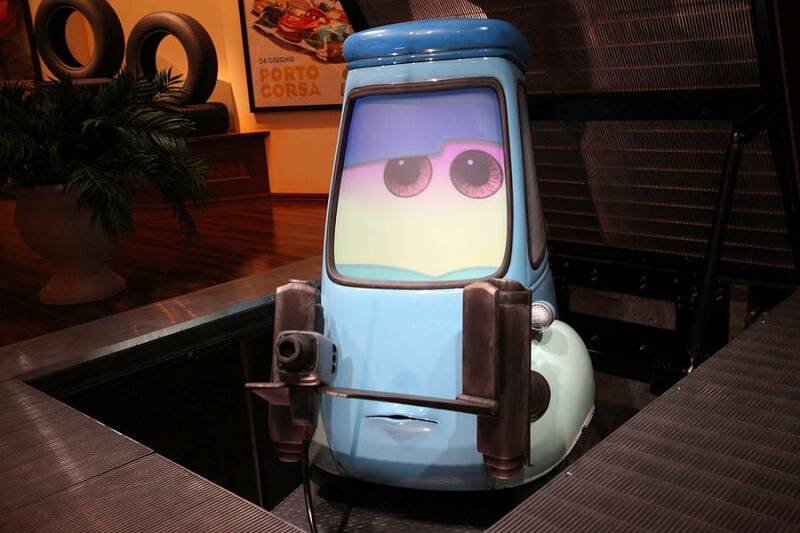 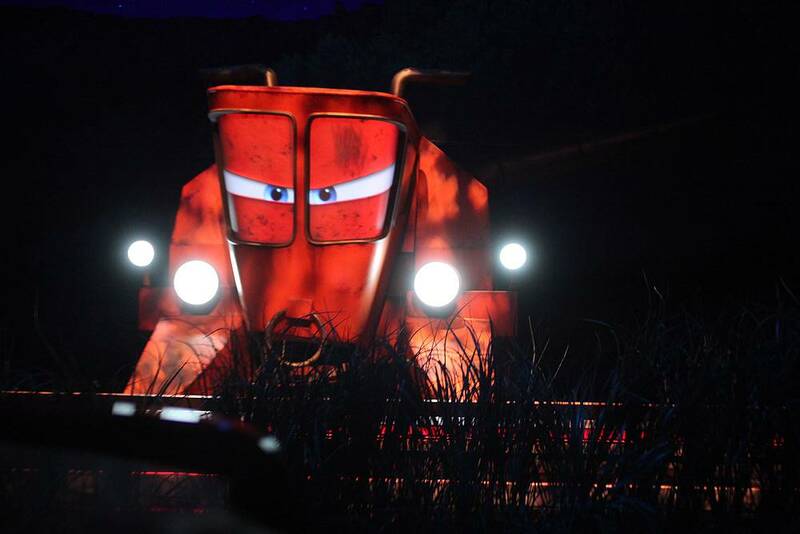 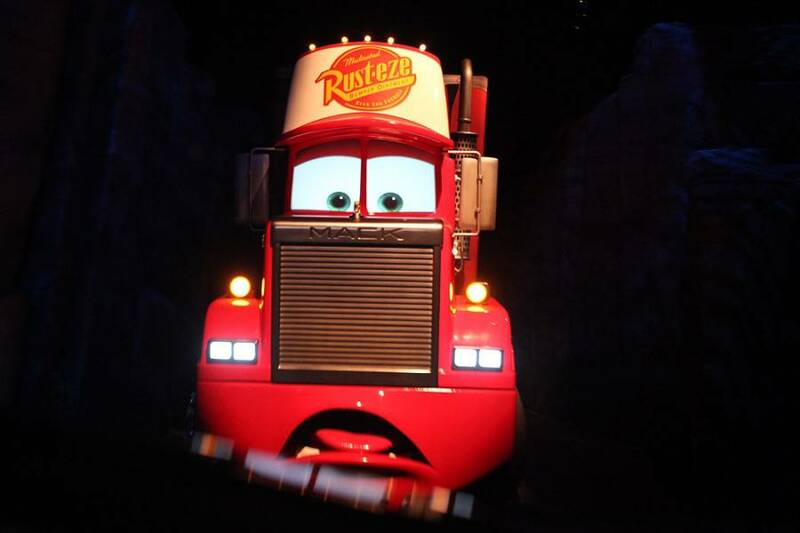 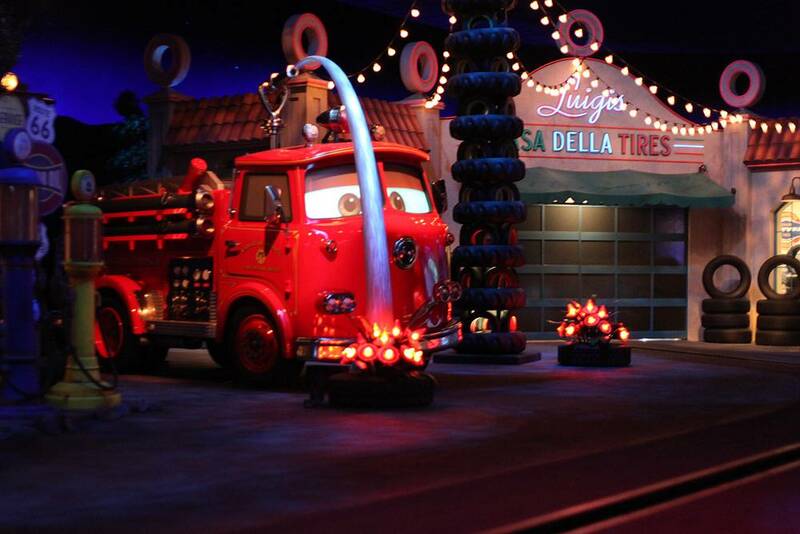 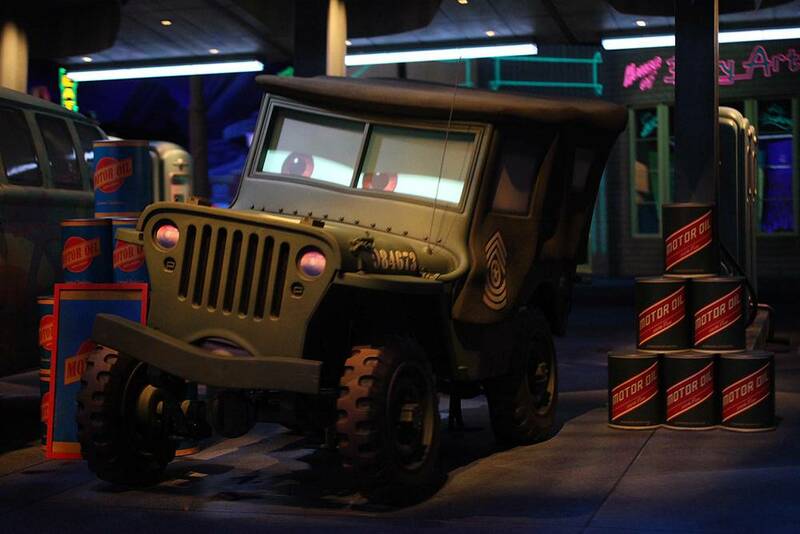 Mater takes you tractor tipping but when Frank is awakened, you head on into Radiator Springs. All the regulars are there including Fillmore, Sarge, Lizzie, Red, Sally and Lightning McQueen. 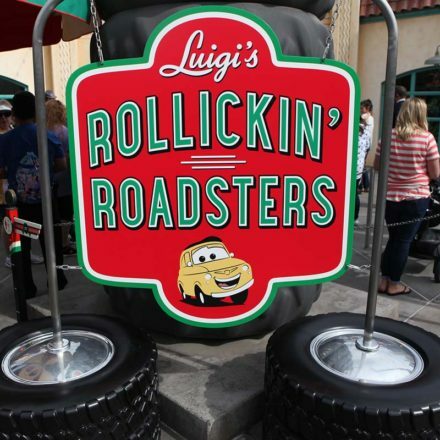 From here you take one of two routes: Left to get new tires from Luigi and Guido; Right to get a fresh coat of paint from Ramone and Flo. 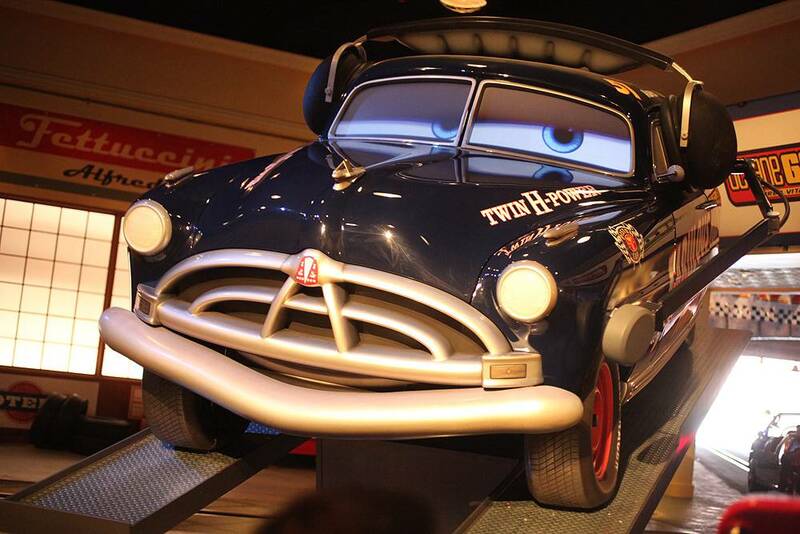 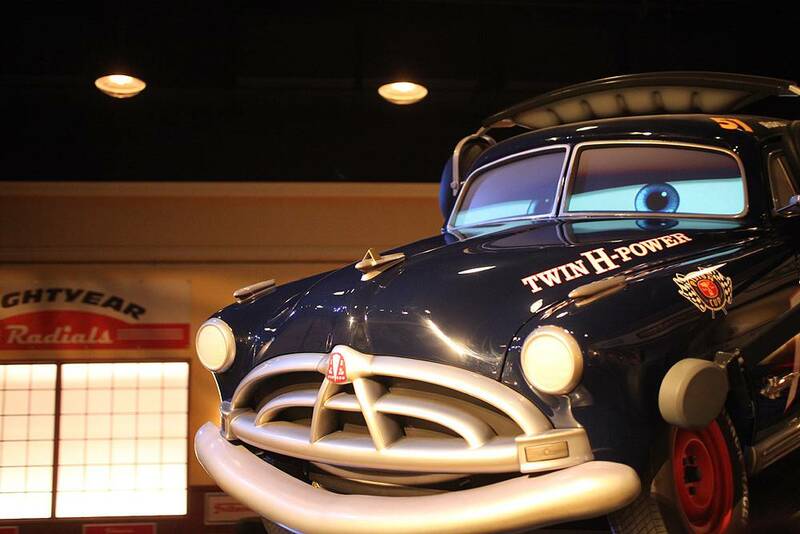 Doc Hudson (voiced this time by Corey Burton for the late Paul Newman) assumes his role as your crew chief no matter which side you go, but Luigi & Guido promise that this will be the greatest race in your life! 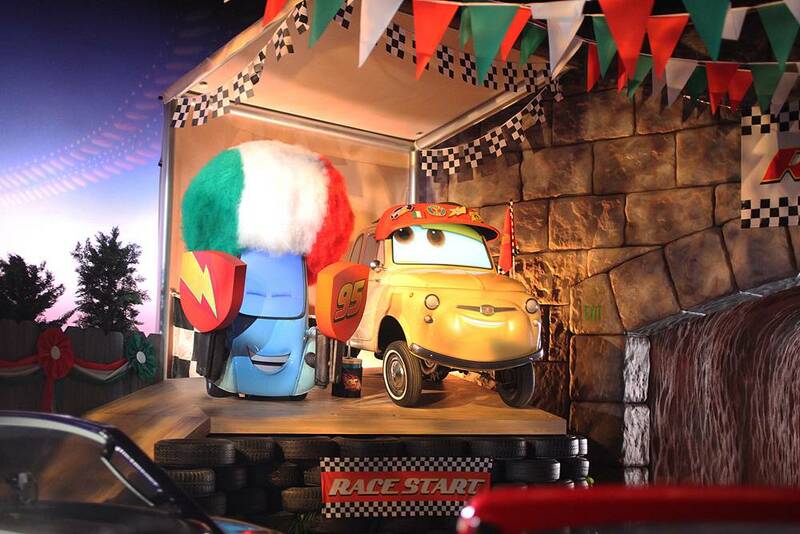 The results of the race are semi-random, relying on an algorithmic sequence that works it all out. So it doesn’t matter which side you’re on, but it sure is fun to act like you’re going to win no matter what! 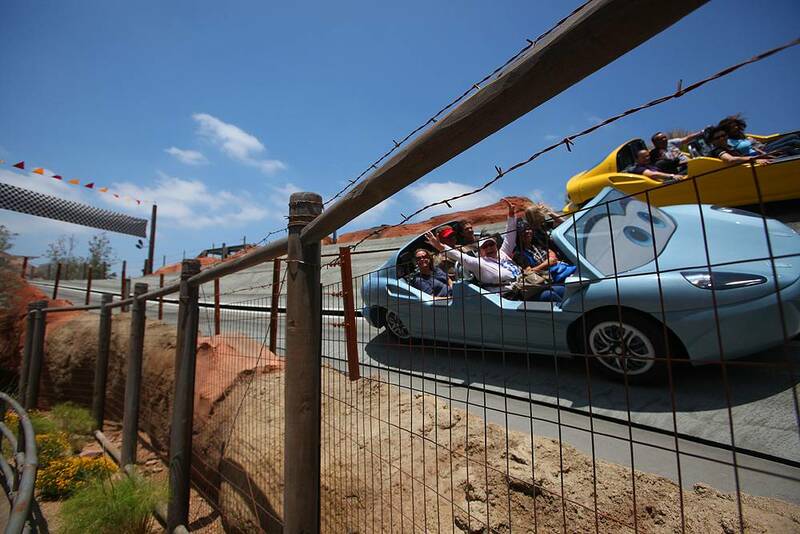 The race segment doesn’t go all that fast so all ages should feel safe to board. 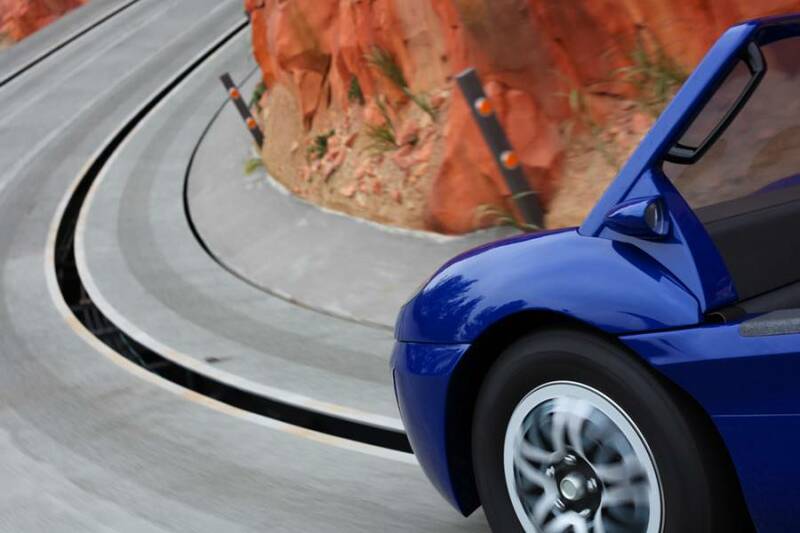 The steepest degree of banking on the track is 45 degrees. 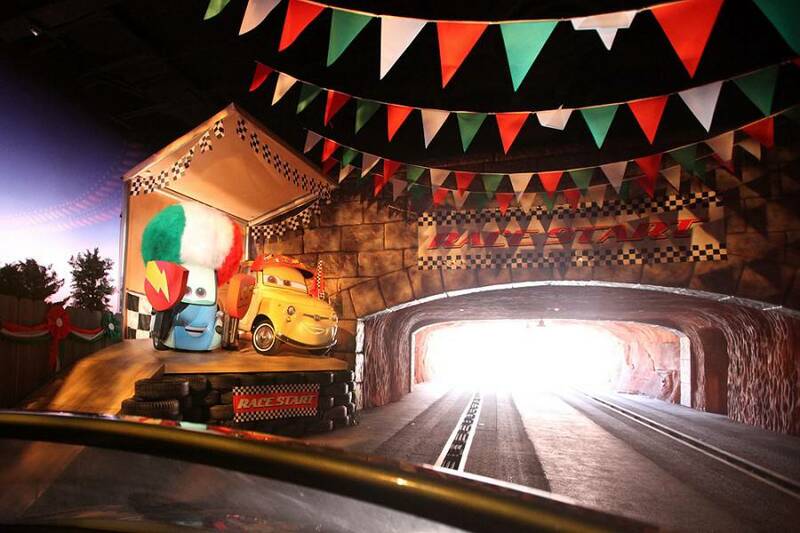 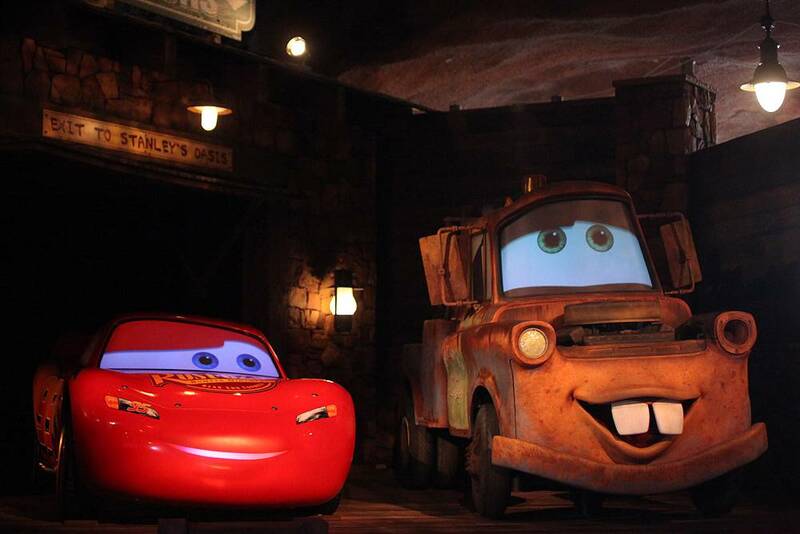 The ride finishes in Taillight Caverns with Lightning McQueen and Mater complimenting you on a great race. 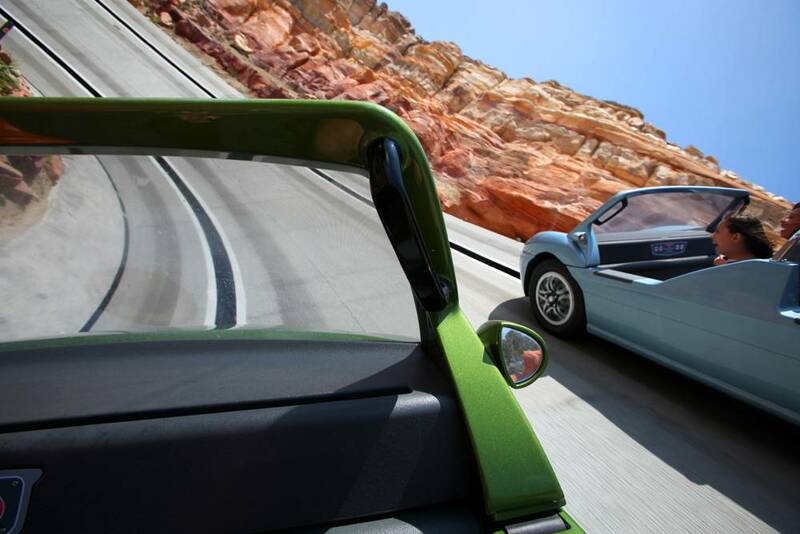 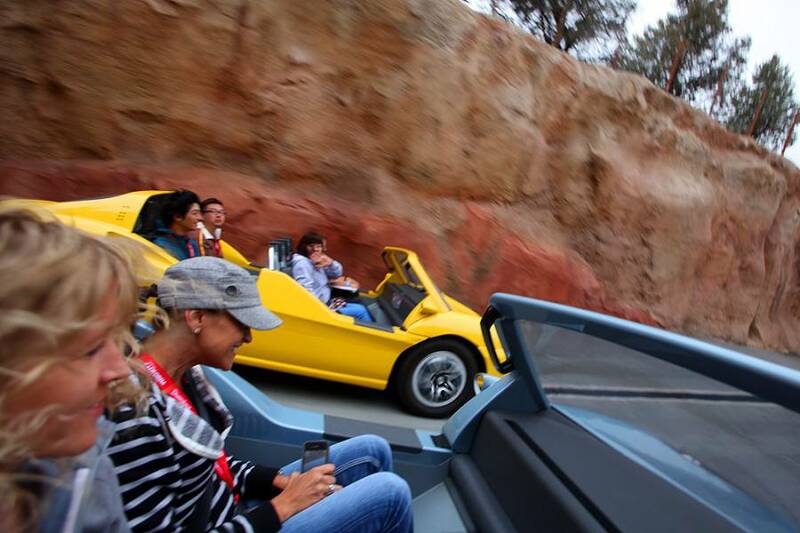 Radiator Springs Racers truly is one of those attractions that only Disney can pull off. Don’t miss it!! 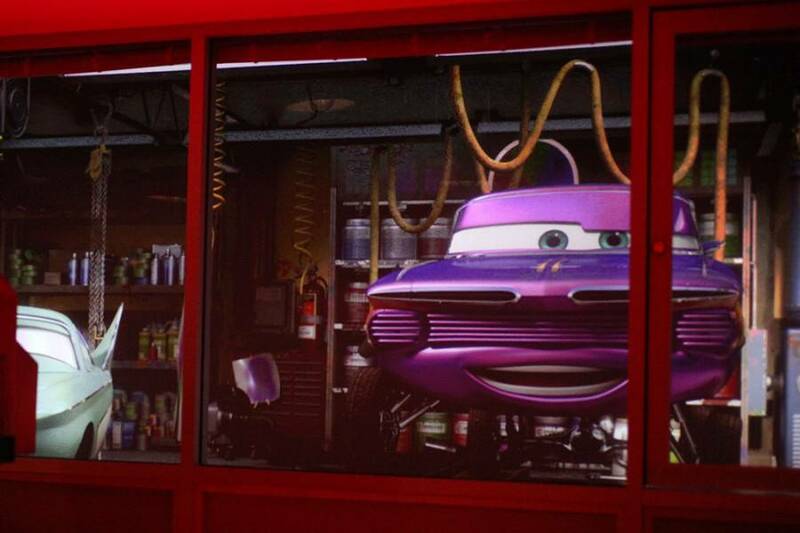 How long did you wait for this? 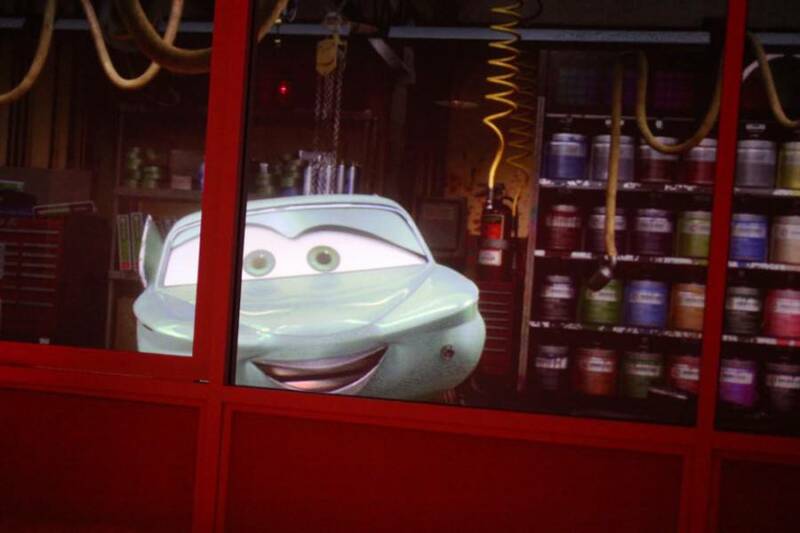 250 minutes is outrageous.